‘Charles Ives’ Sonata No. 1 has its genesis in improvisation: upon leaving Yale in 1898, Ives moved into a flat in New York City with some of his fellow graduates. 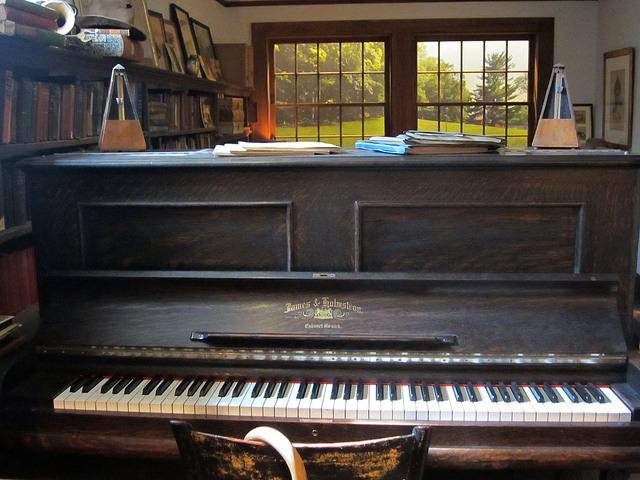 There was a piano, and Ives spent many hours pounding out what his roommates referred to as “resident disturbances.” Ives stated that most of the Sonata was written in 1900-1904. The second movement incorporates the “First Ragtime Dance” for theater orchestra of 1899, also known as “In the Inn.” The fourth movement contains the last music written for the sonata in 1911, although Ives further overhauled the fifth movement in 1914-1917. 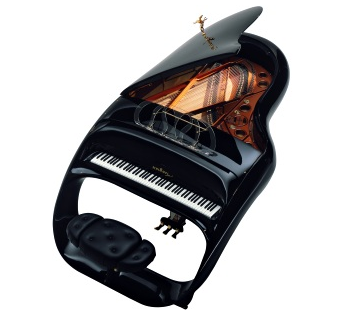 At some point, Ives had a clear ink copy made of the sonata, loaning it to a friend. This score was never returned and has been lost. The “finished” formal scheme would be 1) Adagio con moto, 2a) Allegro moderato-Andante, 2b) Meno mosso con moto (“In the Inn”), 3) Largo-Allegro, 4a) no tempo given, 4b) Allegro-Presto, 5) Andante maestoso. At about 42 minutes, this is Ives’ longest work for the piano, and is written at such a level of difficulty that few pianists undertake it. One pianist who became strongly identified with the Ives Sonata No. 1 was William Masselos, who premiered it on February 17, 1949, recorded it in two variant versions in 1950 and 1967, and helped edit the Sonata’s first two editions. Masselos’ collaborator in these publications was composer Lou Harrison, forced to work without the lost fair copy; certain sections of this work are incomplete save for some practically illegible sketches. Ives left only a hint of what he had in mind for this Sonata; “[it’s] mostly about the outdoor life in Connecticut villages in the 80s and 90s.” Not to second-guess Ives’ intentions, but there is clearly a lot of New York City in this work as well, particularly in its liberal use of ragtime rhythm and even a boogie-woogie styled left hand part in the last movement. There are some amazing, even mind-boggling, technical innovations achieved throughout the whole work, for example the opening chromatic and contrary ostinato, which is counterpoised with single notes falling from the treble range; just like something out of Schoenberg’s 12-tone piano music. Also worth noting is the passage which opens “In the Inn” where a frantic, rushing figure stated in sixteenth note quintuplets are played against a 3/4 accompaniment stated in 4/4 bars. The Symphonic Etudes Op. 13, is a set of études for solo piano by Robert Schumann. It began in 1834 as a theme and sixteen variations on a theme by Baron von Fricken, plus a further variation on an entirely different theme by Heinrich Marschner. The first edition in 1837 carried an annotation that the tune was “the composition of an amateur”: this referred to the origin of the theme, which had been sent to Schumann by Baron von Fricken, guardian of Ernestine von Fricken, the Estrella of his Carnaval Op. 9. The baron, an amateur musician, had used the melody in a Theme with Variations for flute. Schumann had been engaged to Ernestine in 1834, only to break abruptly with her the year after. An autobiographical element is thus interwoven in the genesis of the Études symphoniques (as in that of many other masterpieces of Schumann’s).